« Day 85 – Manny H.
Day – 86 Nathan A. and Harry K.
Today I ended up giving my $10 to two different people! I was joined today by Rebecca Sheir from NPR. We met at my apartment and talked for a little while and then set out to find a recipient. On our walk we saw Anthony from Day 67. He was his upbeat usual self. The next time I see him I will let him know that Maureen is giving him some shoes! He is going to be so excited. Near the White House we found Nathan. He looked deep in thought as he sat by himself on a bench. Nathan is 52, lives in MD, and is unemployed. He questions my intentions when I offer him the $10, but when he realizes that it is a genuine offer, he graciously accepts. Nathan keeps a positive attitude despite being unemployed. He says that he hasn’t bought hardly anything that he doesn’t truly need in over a year to help him save money. In the video below he talks about having to move into a basement apartment to reduce his monthly expenditures even more. He also shares what he is going to do with his $10. You can find Rebecca Sheir’s report of this experience here. We left Nathan and walked around the city some more. Near Gallery Place we bumped into Ivory from Day 49. It’s been over a month since I last saw him but he recognized me immediately. He is still trying to get more books produced. He recently got a shipment of 500 of them which he said he sold out of immediately. Ironically as we chatted with him, the person who is helping him get his book published walked by. We started walking back to Dupont Circle. On our way we noticed a large tractor-trailer with expanded sides. 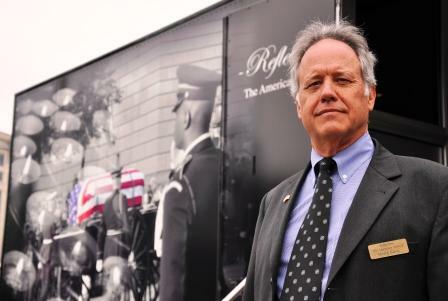 It was a mobile museum exhibit on the customs and traditions of the American funeral. At first I thought this was a very odd exhibit to have, much less housed in the back of a trailer. We were greeted by Harry who is the President of MRA Experiential Tours which operates the exhibit. He invites us inside and shares the history and culture of American funerals to us. He proves to be very knowledgeable on the subject and we find out that he has first hand experience…he worked his way through college working at a funeral home. The exhibit is very interesting and you can find out where it is going to be by checking their website. Although, it might not be completely up to date as Washington, DC was not listed on their calendar. Harry started in the shipping and freight forwarding business for events. He later got the idea of having mobile exhibitions. He now has about 20 trucks in the fleet. He has done work for a variety of well-known companies such as Mattel, Boeing, Tabasco, AstraZeneca, Mazda, etc. You might recall that on Day 82 Keith gave me $10. I wanted to give that to someone but in addition to my regular amount that I give each day. So since I already had given Nathan my $10, I used Keith’s $10 and gave it to Harry. In turn Harry said that he would donate the money to the National Scholarship Program of the American Board of Funeral Service Education. The scholarship program was established to provide financial awards to students enrolled in funeral service or mortuary science programs to assist them in obtaining their professional education. Established during the 1960’s the program has awarded scholarships to hundreds of students. Thanks to both Keith and Harry for making that donation possible! We took a different route back to Dupont Circle and guess who we ran into sitting in Franklin Square? Nathan had met up with his brother and they were sitting talking to each other. We were a few blocks from where we had originally met him. Small world. what a great story – I hope this will inspire my young audience! I love reading you blog and am currently playing catch up. One thing i would ask if possible – can you please write what the recipients do with their $10. I cant watch the videos on my computer and I feel a little sad that i dont get to find out what they do with it. I also wanted you to know that I have been inspired to do something charitable too. I am currenlt trying to find a homeless shelter to volunteer in but the channel/rules and regulations here in the uk seem to be very slow. I think I might knit up a bunch of hats and scarves and hand them out to homeless people I see.